Federal fisheries staff are hoping to determine the age of the three-metre-long shark, which was spotted Thursday. A great white shark has been found dead on the shore of the Bay of Fundy near Advocate Harbour, N.S. Staff with the N.S. Department of Natural Resources spotted the shark from a helicopter when they were in the area doing unrelated work. Warren Joyce, a shark expert with the Fisheries and Oceans Canada, said the endangered species is "extremely rare" in the area. He said they were able to identify the type of shark by its teeth, which are very distinctive. "The great whites are present in our waters, but we usually only hear of encounters once every couple of years or so," he said. Joyce said the last confirmed sighting was off St. Andrew's, N.B. last year, with only three others since 2010. Based on its appearance, Joyce said the male shark has been dead for a while and had some damage to its gills. He said experts hope to study the carcass, which is roughly three metres long, to find out what caused its death. "It's a fairly large animal, right about the size where they start taking seals as their main source of diet. 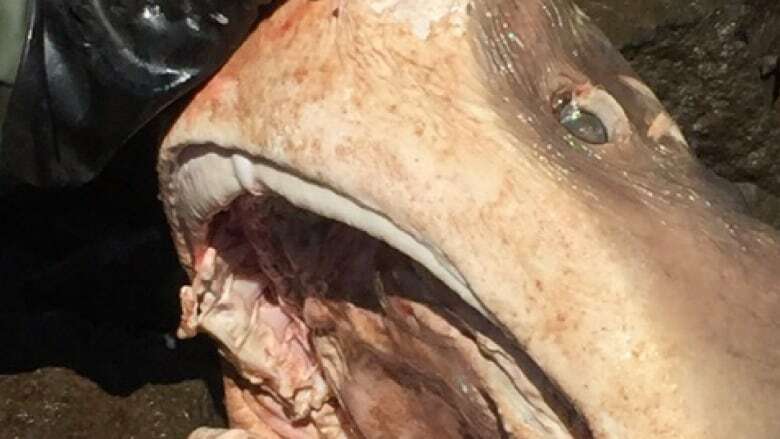 But what could have killed this animal is either an orca — we do have some killer whales present in our waters but they're very rare — or another large shark, but it would have to be a large white shark," he said. "Or maybe it succumbed to a natural death." Joyce also said they will examine the shark's spine to find out how old it was. He said there's so little data on that species in the North Atlantic that biologists don't know how big they typically get at a given age.